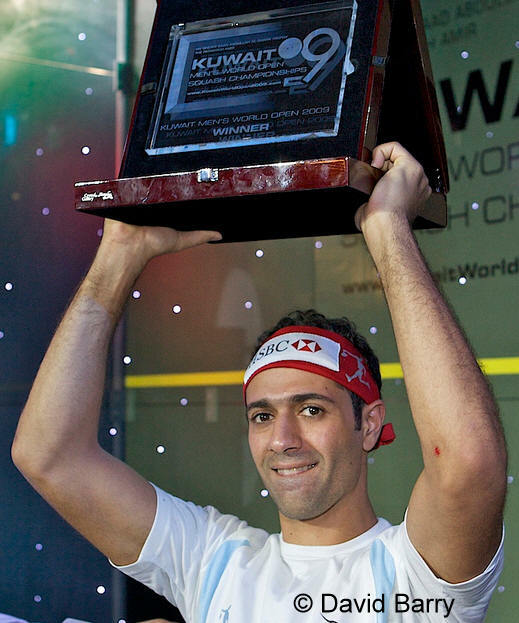 Amr Shabana claimed his fourth World Open title with a comprehensive victory over defending champion Ramy Ashour in the final in Kuwait. It was the type of performance we've come to expect from the 'Prince of Cairo' when it really matters, and only in the first game did Ashour seriously threaten. 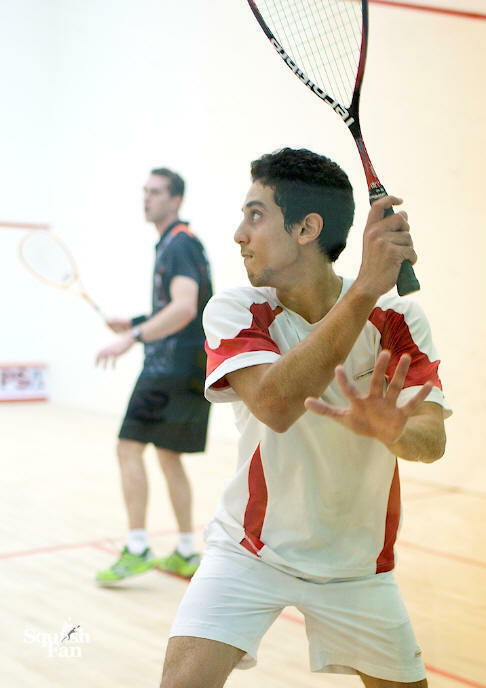 Shabana took an early lead in the opening game, 4-1, and although Ashour struck back to lead 6-4 Shabana was not to be denied, playing fast, accurate squash to take the game, while Ashour persisted with his tactics of going short whenever the chance arose. Shabana was dominating those exchanges at the front though, making far less errors than his young compatriot, and although many rallies ended in lets, Shabana was reaping dividends from that area of the game. He took the initiative in the next game as well, 6-2. 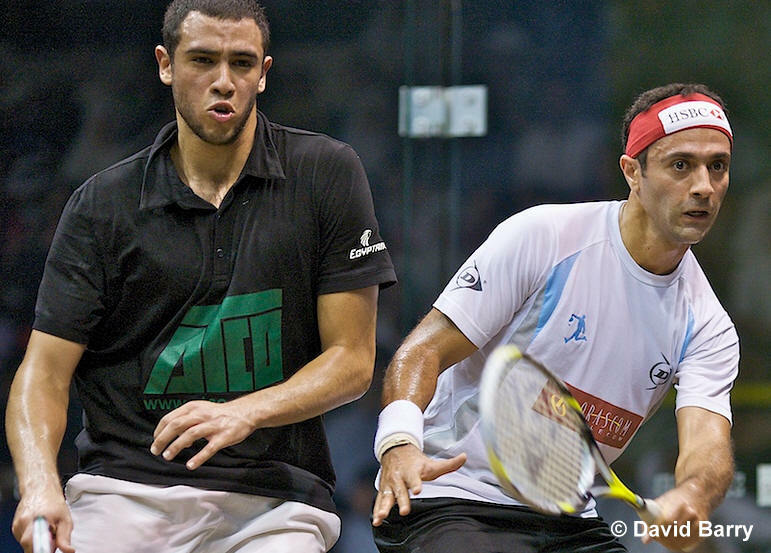 Ashour closed the gap, but try as he might he couldn't get on level terms. Towards the end of the second they exchanged three consecutive two-shot rallies, first Ashour slammed a serve into the nick, Shabana returned the favour, then Ashour tinned as he attempted the trick again. 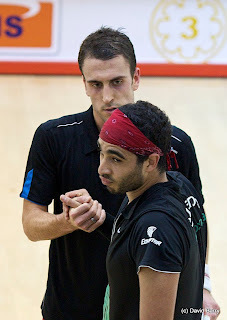 Ashour's frustration showed as he was issued with a conduct warning for ball abuse as he lost the second. The third game saw the same pattern, Shabana opened up to 5-2, Ashour closed to 5-4, then the three-time champion pulled away again, fittingly finishing the match with another service return into the nick. 2003, 2005, 2007 and now 2009, he really does like the 'odd' years, doesn't he ... and he joins Geoff Hunt, Jahangir and Jansher Khan as the only players to win four or more titles. "I felt nervous before the match, and I'm sure he was feeling the same. The final always feels different. 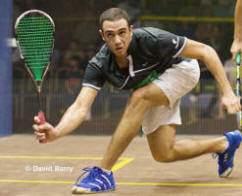 And playing such a great player like Ramy, you don't know what to expect. "It was a very mental match - I felt I had to take it point by point. I was really focussed. I think it was just my day - I'm 100% sure he's going to get days when it's all him!" "Winning four world titles, to join those others, it's a dream. You don't think about it - you just dream about it - it will take a month or two for it to sink in." 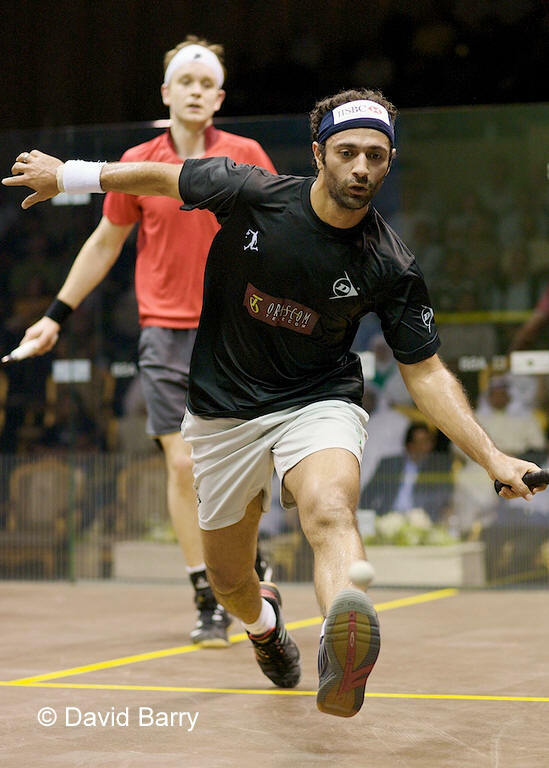 Amr Shabana, champion in 2003, 2005 and 2007, reach another odd-year World Open final as he won a tough four-game encounter with James Willstrop. The Englishman, bidding for his first appearance in the final, found the Egyptian too hot to handle in the early stages, but came back to take the third, and at 9-all in the fourth a decider looked on the cards. But the experienced Egyptian held his nerve to claim the final two points to make the final once more. "It was an unbelievable match - it was a privilege to have played James today," said Shabana. "I have tremendous respect for James, it's hard to play him - he covers the court well for a big guy. I was tremendously keen for it not to go to five games. I could see he was not giving up. It took all my patience." 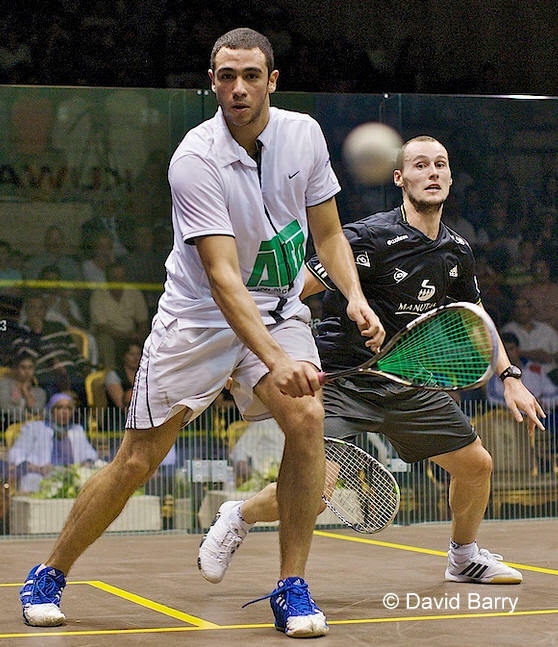 His opponent will be defending champion Ramy Ashour, who overcame world number one Gregory Gaultier in the second semi-final. 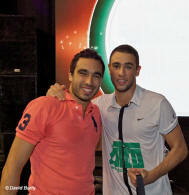 Ashour's shotmaking saw him take the first game with some comfort. The Frenchman struck back to lead 8-4 in the second but couldn't hold off another surge from Ashour. Leading 9-8 Gaultier slipped and needed a three-minute injury timeout, but Ashour took three points in a row to double his lead. Gaultier led again in the third, 5-2, but again Ashour came back, mixing sublime winners with amazing retrieving. Gaultier saved one match ball at 10-9 but could do nothing with the second as Ashour advanced to a second consecutive final. 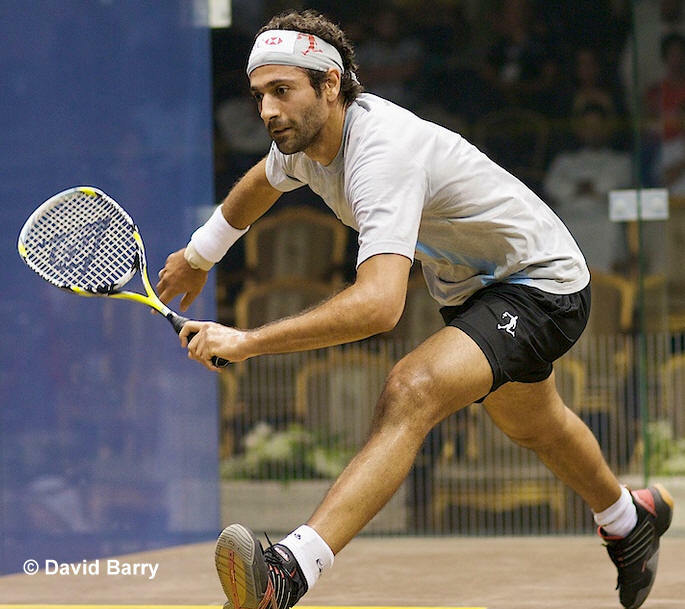 "I was on my form from the start," said an exuberant Ashour afterwards. "I really wanted to win this - I was really keen to reach the final. I try to enjoy every shot I play." 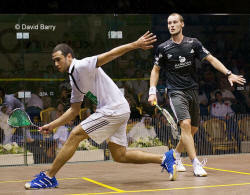 The quarter-finals featured three Egyptians, three Englishmen, two Frenchman but - for the first time ever - no Australian. First up was James Willstrop versus the 2004 champion Thierry Lincou. After a competitive first game, won 11/9 by Willstrop, Lincou slipped in the middle of the second and appeared to be favouring a knee he's had problems with for a while. 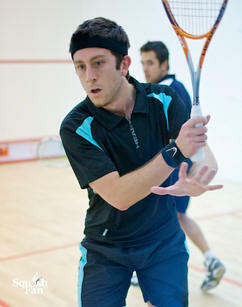 Willstrop took full advantage, taking the next two games 11/5, 11/5 to move into the semi-finals. "That was a good solid game," said Willstrop. "He's one of the toughest opponents mentally - but I just managed to keep on top of him. If I'd come off the pace, it could have let him in." His opponent there will be three-time champion Amr Shabana, who continued the impressive form he's shown of late with a straight-games win over fellow Egyptian Wael El Hindi, 11/1, 11/5, 11/9, to reach a fifth World Open semi-final in a row. "You have to play perfect squash against Wael," said Shabana, "and I had a bit of an advantage as I have played on the court all week and this was his first time. We know each other well - he's almost like family. In fact we are rooming together here in Kuwait - It's sometimes tough to beat the other guy when it's like this." 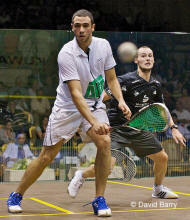 A second Egyptian place in the semis was booked when defending champion Ramy Ashour beat Peter Barker in four. 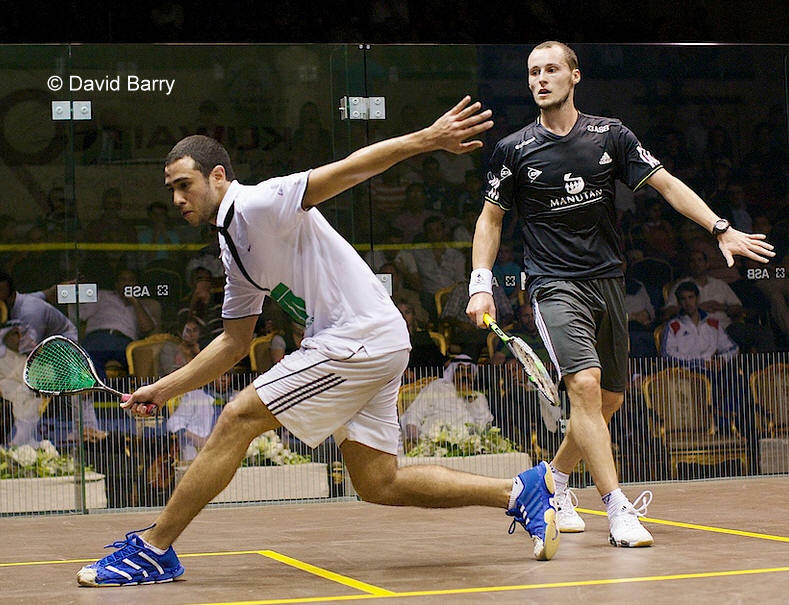 Ashour was in scintillating form in the first two games, but Barker wouldn't let him get away in the third as he pulled one back, much to Ashour's annoyance. The Egyptian's shotmaking skills paid dividends at the end of the fourth as he finished that game off in style. "I was in the zone for the first two games, but then let things slip in the third," admitted Ashour. "But I was really glad with the way I played in the fourth - I really kept it tight to the wall. I think I did my job today." Ashour will meet new world number one Gregory Gaultier for a place in the final. The Frenchman won a see-saw match against Nick Matthew, both players enjoying long spells of total dominance, but it was Gaultier who got the better of the final stages, coming from 2/1 down to win the last two games convincingly. 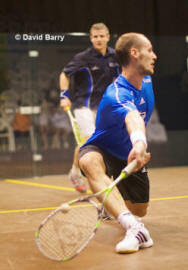 "The third game was rubbish - I lost my focus," said Gaultier. "I decided to put that third game in the garbage and start again. I knew it was possible - everything is possible. I just had to keep my focus. Once I got the lead in the fifth, I kept my head down. I knew I could beat him - and in the end I could see that Nick was getting slower. So I pushed myself. "Squash is such a mental game - it's always such a mental battle between us, but today I was stronger." "As I warmed up on court, I felt a sharp pain in the calf, right before starting. I kept on wondering if I should stop, if I wasn’t making it worst by keeping on playing, and that affected my mental preparation, not to mention my movement. Also, I just couldn’t get used to the floor, it was my first match on there, and that sharp pain, I just couldn’t settled in the beginning, especially as everybody knows I’m a bit of a nuisance with my attention to details thing! "And I guess that’s what explains my wary start, I wasn’t aggressive enough. It has to be stressed that James yet again tonight played out of his skin, another stunning match, bravo to him really… He played very tight, and prevented me from playing too fast. "Of course, very very disappointed. 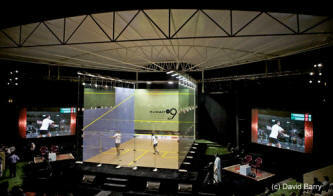 It’s rather frustrating, because I feel good in my squash, I’m enjoying it tremendously since the World Teams, I’m having good matches, but that pain that keeps appearing and disappearing at will… Rather annoying…"
The second session, at Green Island, got off to a delayed start due to bad weather - at one point it looked as though the matches would be moved to the Salmiya Club - but quickly turned sensational as James Willstrop downed top seed Karim Darwish in four games. No surprises in the final three matches as three-time champion Amr Shabana, defending champion Ramy Ashour, and new world number one Gregory Gaultier all came through safely enough. "He was quite dominant in the third and fourth games and put me under a lot of pressure, he didn't give me a lot of chances - he's one of the best players in the world at getting the ball into the back corners." "I think I coped with the court problems pretty well - though I'm not sure other sportsmen would have done so. The issue was dealt with as well as it could be by all concerned." "I think I must be back to where I was after my injury problems, if I can beat the best player in the world ..."
First winner today was 2004 Champion Thierry Lincou, seeing off Alister Walker in four games, 11/2, 11/8, 4/11, 11/6. "I had a bit of a loss of concentration, especially in the third - I didn't push mentally to keep the pace up," explained the former world number one from Marseille. "And when you let the pace go, he's dangerous player. "I've heard him referred to as the English Egyptian - and it's true, he plays like an Egyptian. 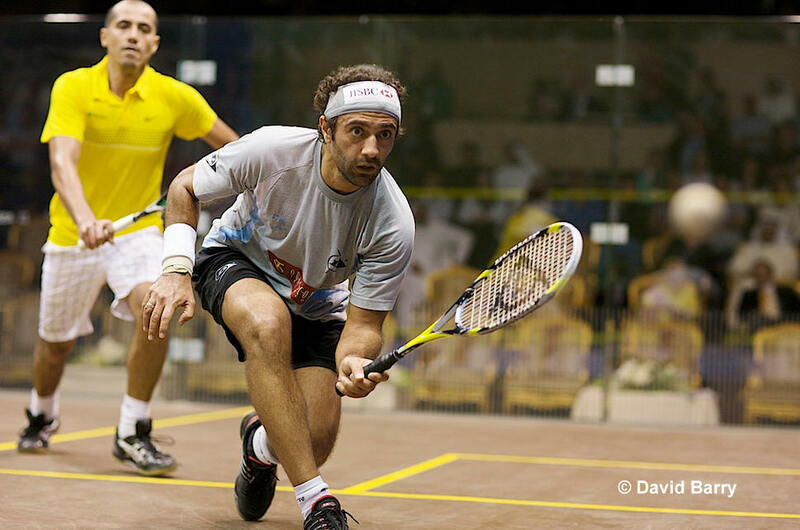 Ali beat Shabana a few weeks ago - he's capable of beating anyone." 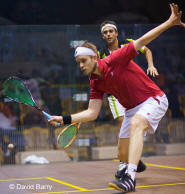 Peter Barker became the first Englishman through, avenging yesterday's defeat of Adrian Grant by Hisham Ashour. 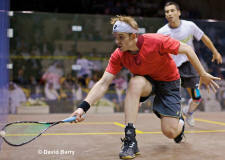 Barker won 11/6, 11/5, 8/11, 11/9 to mark claim his first World Open quarter-final appearance. "I feel relieved most of all - happy, yes, but more relieved," explained the left-hander afterwards. "Somehow, I just couldn't relax - I played well in the first two games but then let him get back in the third. 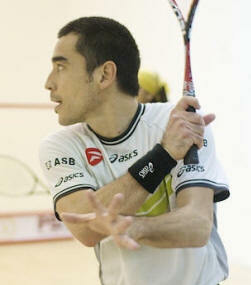 "But it's great to be in the quarter-finals of the worlds for the first time - after all, that's where it all happens. 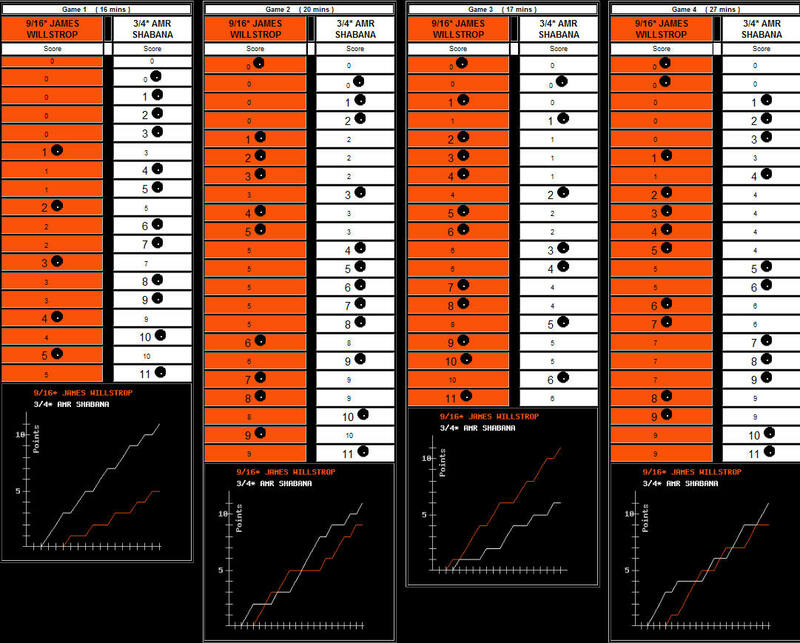 There are eight players remaining so one of us has got to win it - so let's hope it's me! The pressure's off, but I'm not going to relax. 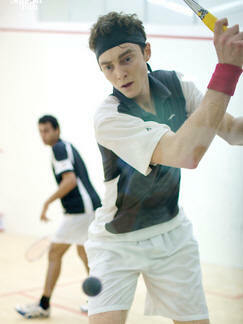 I played my best squash in the first two games so I hope I can replicate that tomorrow." 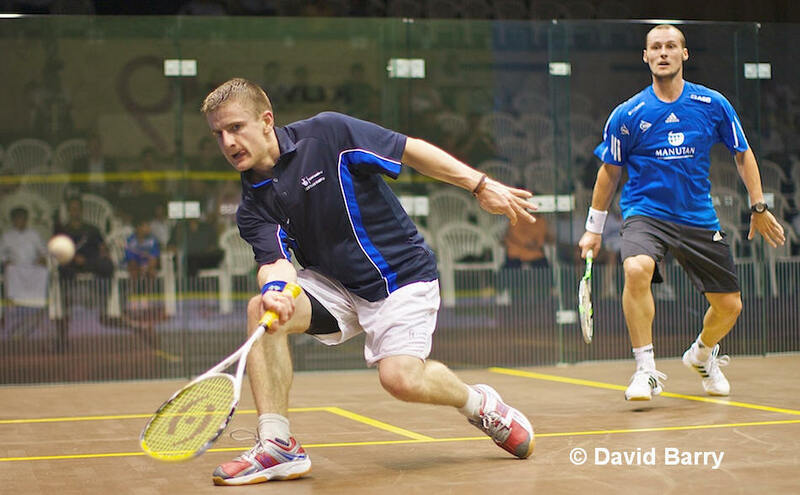 Nick Matthew joined Barker in the quarters with a quickfire 11/6, 11/3, 11/2 win over Cameron Pilley to end Australian interest. 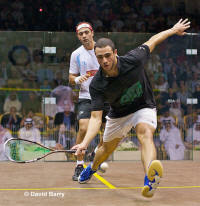 The first Egyptian went through to the quarters when Wael El Hindi took on yesterday's biggest giant-killer Tarek Momen. The youngster took the first, but El Hindi was in no mood to allow another upset, winning 10/12, 11/6, 11/7, 11/6 in one minute over the hour. Egypt's Hisham Ashour grabbed the headlines normally given to his younger brother Ramy, the defending champion, when he upset 10th seed Adrian Grant. 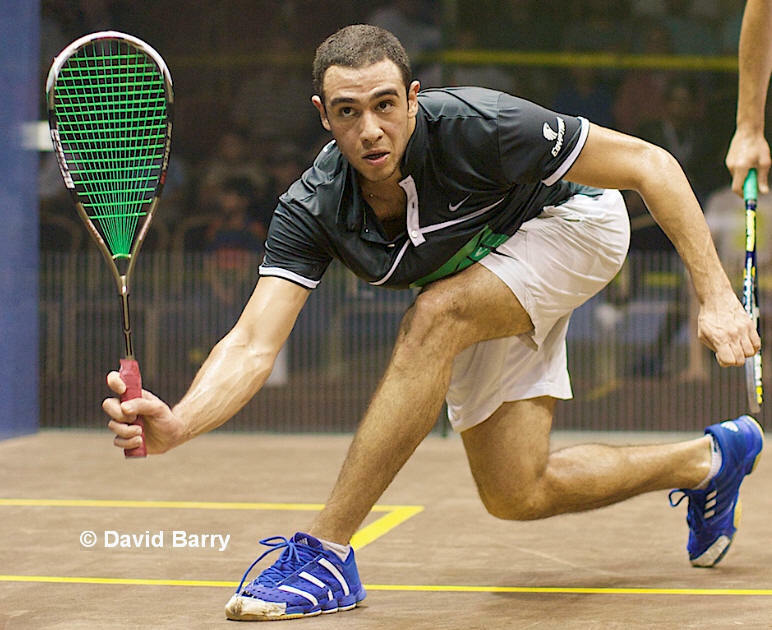 The 27-year-old from Cairo - who was close to exiting the event yesterday when he fought back from 0/2 down to beat English outsider Chris Simpson - was in devastating form today as he despatched the world No10 from London 13-11, 12-10, 11-9 in 44 minutes, saving game balls in the first two games. Cameron Pilley ensured Australian interest in the last 16 when he beat 16th seed Mohamed El Shorbagy in a significant upset in today's second round. It was only a year ago that El Shorbagy, the world junior champion, romped through to the quarter-finals of the World Open as a qualifier in his maiden appearance in the event. 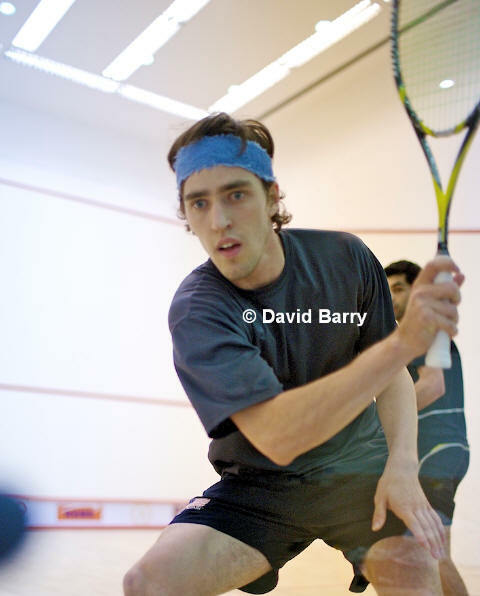 The 18-year-old from Alexandria, the brightest prospect in the game today, took a two game lead against Pilley before the tall Aussie began his fightback, eventually winning 9-11, 8-11, 11-3, 11-4, 11-3 in 68 minutes. 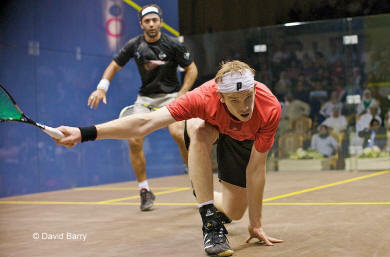 It was a distraught El Shorbagy that left the building immediately after the game. The last sixteen will not include veteran Australian star David Palmer for the first time since 1998 after the two-time world champion crashed out of the Kuwait Men’s World Open 2009. 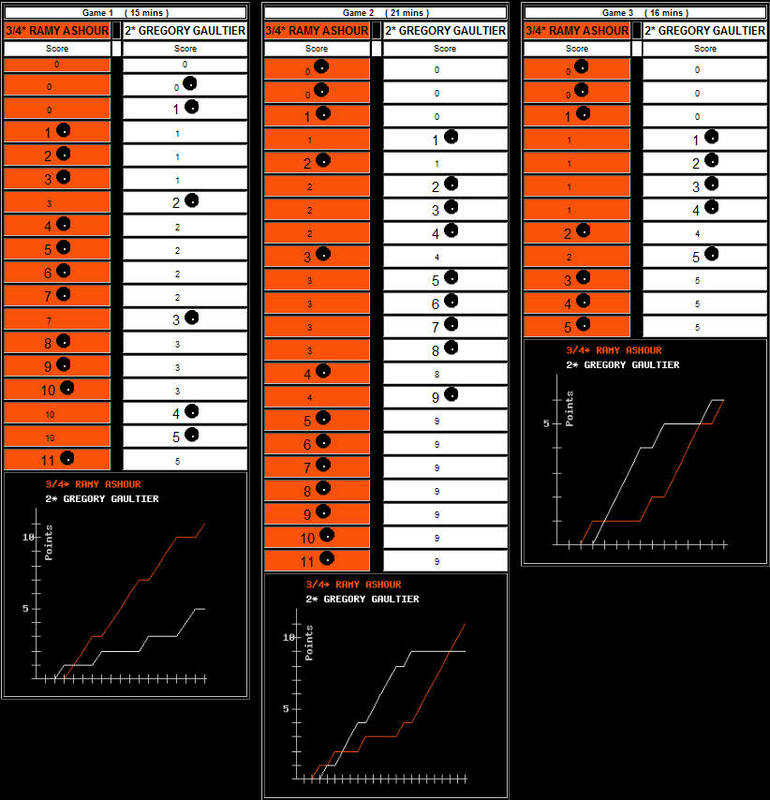 David was unable to convert game balls in the first two games and failed to exploit an early lead in the third before going down in a rare straight games defeat. England's Daryl Selby survived the longest match of the tournament so far when he upset Malaysia's 12th seed Azlan Iskandar 11-7, 7-11, 9-11, 11-7, 11-8 in a 135-minute marathon. 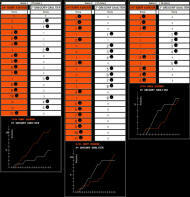 "He was too good in the first two games, but dropped off thereafter. I'd opened up the court too much for him in those early games, but managed to straighten up both sides later. "He's improved out of sight since I last played him - he had nothing to lose a year ago, but now the pressure's on him as a top seed. "It'll be interesting to see how he deals with the pressure. He can't afford to keep on playing like that." "I was fine in the first two games - then I don't know what happened. I was so nervous and couldn't shake off that feeling." "If I hadn't had that five-game match yesterday, I wouldn't have won today. "Before I came here, I hadn't had a good win for three or four months - yet I feel I'm playing well. "But the way I played today is my game - my problem is that I don't play like that all the time. 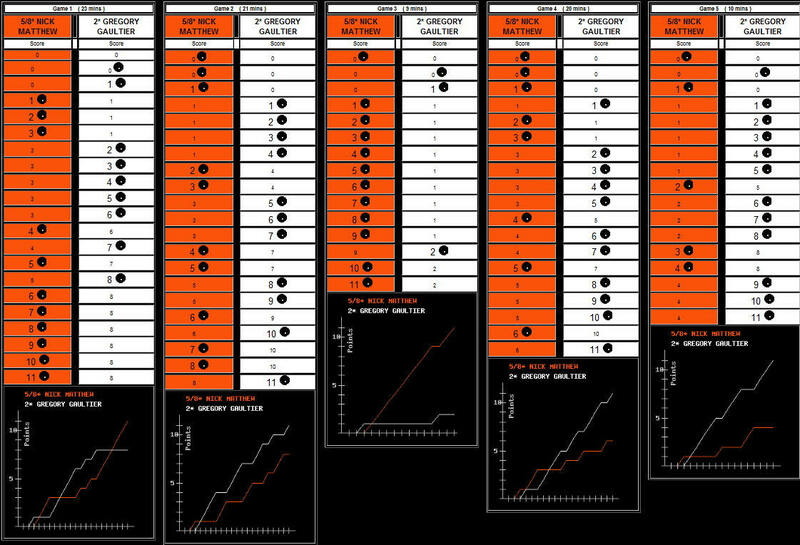 If I played like that, I'd be top five!" "I used to be the one motivating him - now he's motivating me. We always have five-setters when we train - and he's world champion! "I need to move up - these are my last three years in the game. I know I have it!" "It's hot and humid on the glass court in the evenings, but that doesn't suit me and the other Egyptians any more than the Europeans. "They're going to suffer tremendously ...we're just going to suffer." "I didn't believe I could win today - I didn't expect this performance". 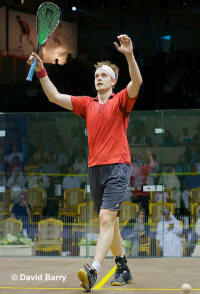 "It's a huge win for me, but it's my second best - as I beat Gregory Gaultier last year in Egypt! But it has the same taste." "I'm really disappointed - I've struggled with my form for the last couple of tournaments. I'm struggling to play at the standard I'm used to. 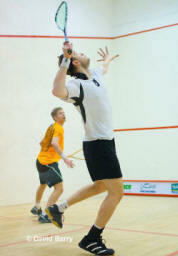 "I'm just not getting enough match practice - and I need to try and rectify this if I am going to carry on. I don't get the chance to work with my long-time coach Shaun (Moxham) and I need to make a decision about this. "I didn't hit the ball well this morning - and normally I can deal with that. I can't get myself out of trouble like I used to be able to do. 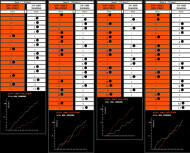 "There are still three big tournaments left this year, so we shall see how I do. 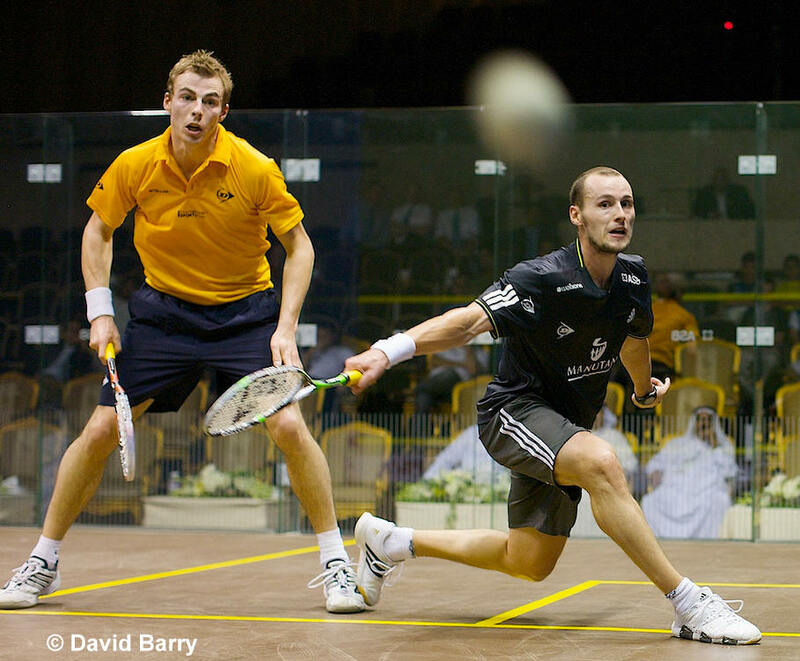 I want to keep going until next year's Commonwealth Games and the 2010 World Open in Saudi." English team-mates Peter Barker and James Willstrop also survived testing first round. 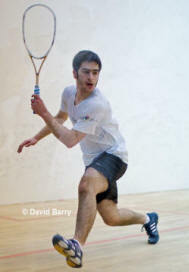 Barker, the No7 seed from London, faced qualifier Nicolas Mueller a 20 years old rising squash star from Switzerland, while Willstrop, a former world number two who is fighting back to the top of his game after ankle surgery earlier in the year, beat English qualifier Robbie Temple 13-11, 11-7, 11-0. England's fifth seed Nick Matthew had the easiest path through to the second round when his Irish opponent John Rooney was forced to retire injured at the end of the first game - after just 12 minutes. Julian Illingworth, the world No33 who claimed an unexpected slot as the last of the 32 seeds after the withdrawal of top-ranked Spaniard Borja Golan, took full advantage of his opportunity by becoming the first US player to reach the second round of the World Open in its 33-year history. The New York-based 25-year-old beat experienced New Zealander Kashif Shuja 11-5, 11-8, 12-10 in 46 minutes to set up a second round meeting with second seed Gregory Gaultier, the new world number one from France. 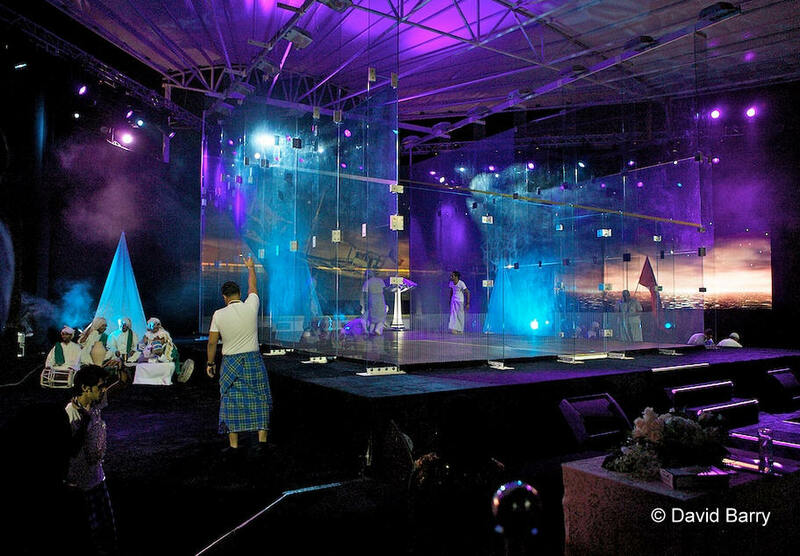 Egyptians dominated the remainder of the evening on the all-glass court. Top seed Karim Darwish defeated Pakistan's Mansoor Zaman 17-15, 11-4, 11-7 in 30 minutes - while three-time champion Amr Shabana, who boasted a 33-month reign at the top of the world list, beat English qualifier Shaun le Roux 11-6, 11-5, 11-6. 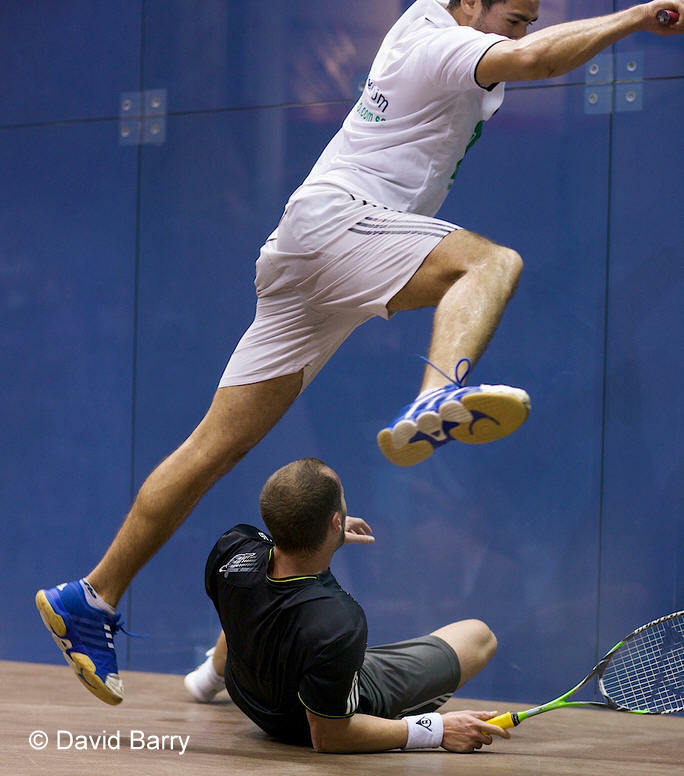 But defending champion Ramy Ashour had the easiest ride, winning the first game then being handed the match when Mexican opponent Jorge Ferreira realised during the knock-up preceding the second game that the knee injury picked up during the match would not allow him to continue. 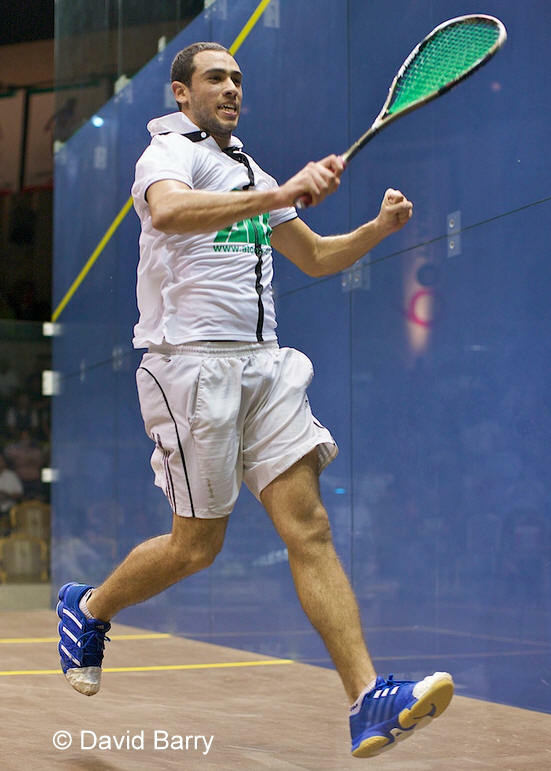 Cheered on by a packed partisan, local wildcard player Abdullah Almezayen played the game of his life - and was three points away from a stunning upset against Egypt's 24th seed Omar Mosaad. 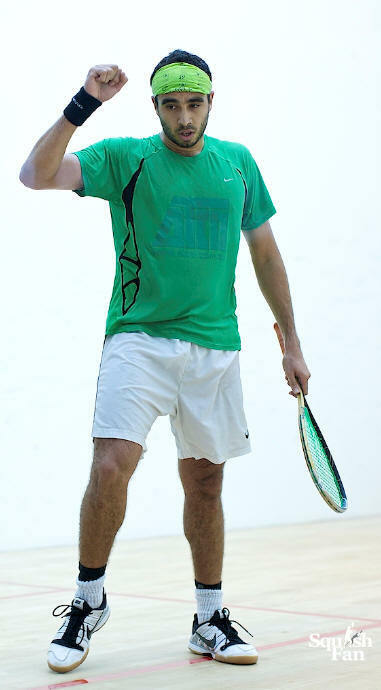 Frenchman Renan Lavigne was delighted to provide the second upset of the day - on his 35th birthday! The world No38 from Marseille reproduced the same skills that took him to a career-high No17 five years ago to beat Canada's 30th seed Shahier Razik 11-9, 9-11, 11-5, 11-3 in 71 minutes. Lavigne now plays England's rising star Alister Walker, the 15th seed who beat Hungary's Mark Krajcsak 11-6, 11-6, 6-11, 11-5. Omar Abdel Aziz was revelling in the support the locals gave him in his 11-5, 11-6, 15-13 upset over Miguel Angel Rodriguez, the 23rd seed from Colombia. For the « New Italians », there were contrasting fortunes - Amr Swelim and Stéphane Galifi have recently switched allegiances to play under the Italian flag. 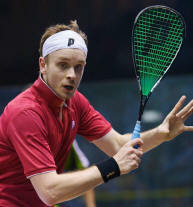 Swelim upset an out-of-sorts Joey Barrington, the 26th seed from England bidding to reach the second round for the second year. The former Egyptian, still based in Cairo, beat Barrington 11-8, 12-10, 11-9 in 53 minutes - and will now meet Egyptian Wael El Hindi. 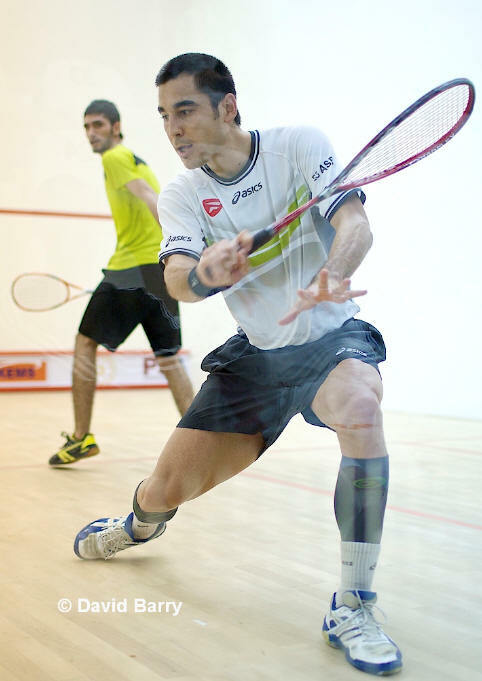 It was ninth seed El Hindi who beat former Frenchman Galifi 9-11, 11-8, 11-3, 9-11, 11-6 in an ill-tempered match which lasted 85 minutes. A match which took 85 minutes of playing time - yet also featured a two-hour 'blood injury' break while Davide Bianchetti was taken to a local hospital - saw the Italian ultimately prevail 15-13, 11-6, 6-11, 11-2 over French qualifier Yann Perrin in the final match of the day at the Salmiya Club. 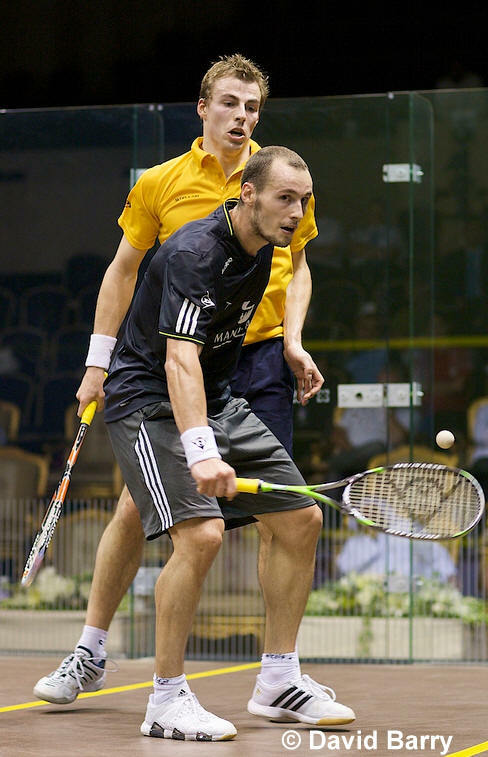 Frenchman Gregory Gaultier celebrated his first day as world number one with a convincing straight games victory over Scot Alan Clyne on an all-glass squash court at the Green Island Resort. Gaultier, seeded to reach the final for the third time in four years, was in commanding form as he despatched Clyne 11-2, 11-5, 11-7 in just 27 minutes. "He's a good player - much more experienced than me. And that was clear in the last few points - perhaps in the future I will be able to deal with those situations better. "But overall I am very happy with today. 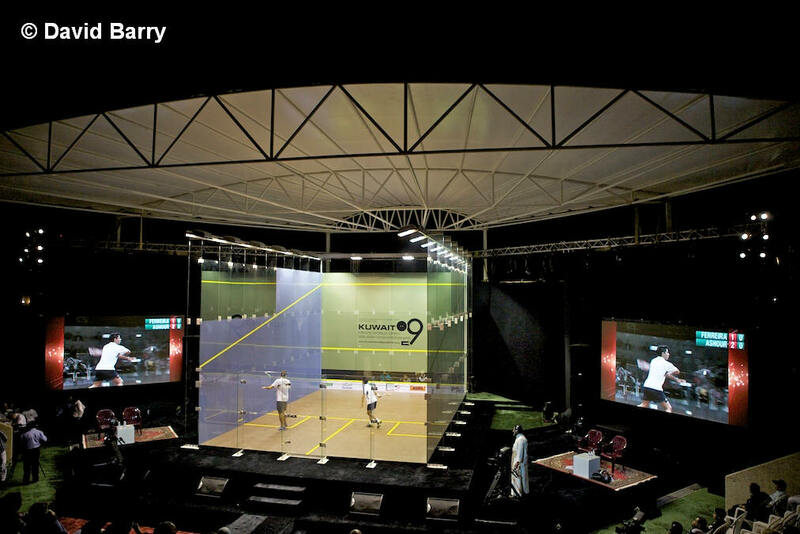 This event has been great for squash in Kuwait - and it has also helped me get more personal sponsorship which will allow me to travel to more events on the world tour." "Yann's racket caught me on the chin, and I had three stitches to stop the bleeding. That wasn't as painful as the anti-tetanus injection in my backside - which seems to be restricting my movement." "It was a good first round match - I was really focussed and well-prepared. I knew it was his first time in the World Open and I was confident I would get through. "But he gave me a good run, so I'm really pleased to have won 3/0." "When I got back from Hong Kong, there was a lot of media interest at home - which was nice - and I tried to do everything possible. "I have been aiming at this number 1 spot for the past two or three years - I feel really confident being number one. "It's a relief that I have finally achieved this goal. Now I'm not running after it - I can now just enjoy my squash."